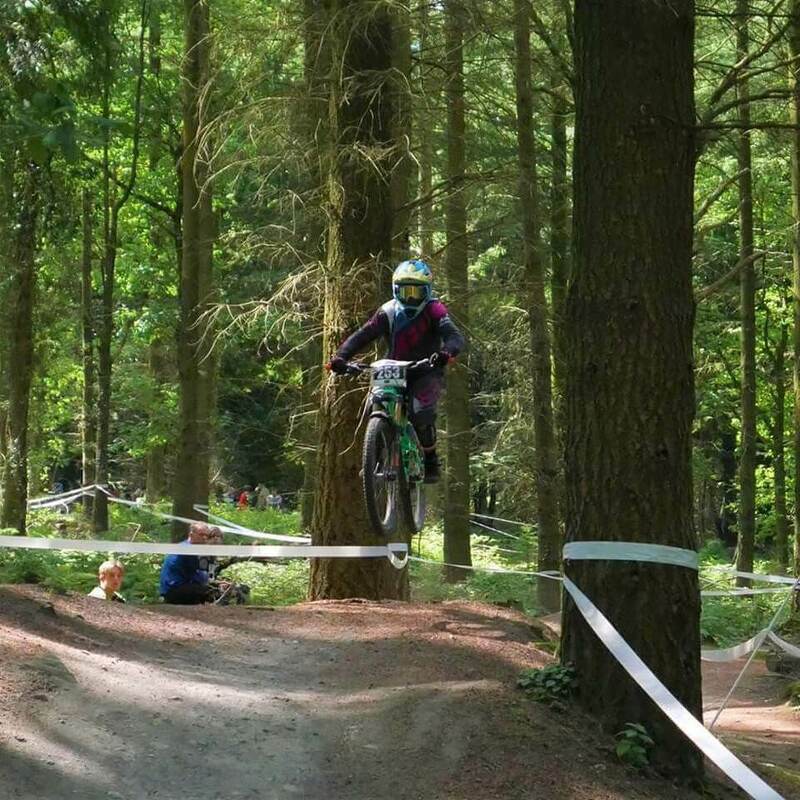 Round 3 of the MIJ summer series was held at the Forest of Dean on Sunday 9th July on the Corkscrew run. All female riders were put into one ladies category so 11 year old Elin was up against some fast riders, here’s Elin’s race report. MIJ 3rd round was corkscrew; it’s a short but very fast course and I was looking forward to racing down it. My practice runs could have not gone better. I watched a few of the competitors and noticed some were taking different lines to me so I decided to try them out too. One was half way down the bottom section where there is a steep rooty section in-between some trees which I had gone around previously. I pulled up to it and broke as I was not sure about it. There were some racers stood by the side who were really good and talked me through the line and my body position, so I pushed back up to give it another try and was so chuffed that I did it! This line was definitely faster so I decided to stick with it. At the top waiting for my 1st race run there were no nerves just excitement; everyone was buzzing and the whole atmosphere was brilliant. On the top section I pedalled as hard as I could to build up speed. I hit the jump and it was the most air time I have got. There are a few drops leading up to the fire road section and I decided to go around one of them as it meant keeping more speed. As I approached the descent onto the fire road I hit the first drop a bit too fast and I felt I was not in the right position on the bike and before I knew it there was another drop and my landing was all over the place; I didn’t correct it in time and my front wheel caught the bank on the side of the descent and yes I flew off the bike! There were spectators who lifted my bike off me and got me to my feet, thankfully I wasn’t hurt and knew I could carry on. I decided to wait for all the other woman to come down as I didn’t want to affect their race runs. After the 1st run I was in last place with a time of 5mins. I decided I needed to push hard on the 2nd run to make up for it. The other women’s times were so close together not even a second between them. On my 2nd run I was going faster than I had ever ridden this course and felt really good. My bike was soaking up all the ruts and roots. I flew past the fire road section with a big smile on my face as it did not beat me this time. I dropped down in to the bottom section into a bumpy rutty section and I knew the steep rooty part was coming up and I was slightly to the left so turned inwards but could not believe it, my wheel slid on a root and I was off the bike again! I grabbed the bike and started running, jumped back on just in time to hit the steep roots then I was building up speed once again. I finished with a time of 1.22mins. I was frustrated but still smiling. I am walking away from this race having learnt it can not all go to plan on race day. Roll on round 4 I cannot wait! !